This year's IKV students' excursion (StudEx), which took place from 22-25 May, provided a particularly interesting insight into various aspects of the industry. 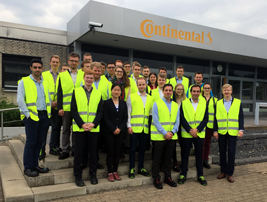 During the course of the four days, 26 students of plastics technology visited a number of plastics processing companies throughout Germany that are members of the Institute's Association of Sponsors. The packed programme included visits to A. Schulman GmbH in Kerpen, the BMW plant in Leipzig, Sumitomo (SHI) Demag Plastics Machinery GmbH in Wiehe in the eastern part of Germany, RKW SE in Echte, Continental ContiTech in Northeim (both situated near Göttingen), Phoenix Contact GmbH in Blomberg and Evonik Industries AG in Marl. The companies thus covered a broad spectrum of the plastics value chain – from compounding and machine manufacture through to plastics processing. During the visits, the students were particularly impressed with the size of the machines: "As a student worker in rubber compounding, I am dealing with laboratory-scale internal mixers. During the students' excursion, I was able to experience close up the compounding process in giant 260-litre mixers and see enormous mills in operation. This insight into the industry certainly left an impression on me. I really enjoyed the excursion with my fellow students, and I would be delighted to have an opportunity to take part again next year," said Lukas Seifert, a student at IKV. IKV would like to thank all the participating companies and students for the successful event, and is already looking forward to the next StudEx in 2019.